When I was a teen, climbing 14ers was a scary but fun summer pastime. By scary, I mean that I can't recall an ascent where my life wasn't threatened in some way. On my first attempted ascent of Grays Peak, I can remember how my dad had told me that Grays was one of the easiest climbs within a few hours of Denver. A Climbing Guide to Colorado's Fourteeners by Lampert & Borneman said so. I remembered that while jammed inside the cleft of a large rock, 50 feet off the trail, wrapped in a heat reflective blanket, wondering if I'd see my dad again. What does that have to do with the film below titled Force of Nature? Everything. On my way to our climb, the last towns I passed through were Georgetown and Silver Plume. G-town was where they'd likely bring our bodies, I reasoned. I breathed out curses on guidebook writers and, in the very next breath, prayed that lightning avoided men on the exposed sides of mountains and boys stuffed into rocks beneath them with equal disdain. It was only a couple of years after they had rebuilt the Loop in the valleys below my misadventure. 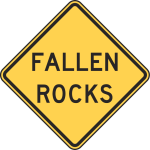 Colorado's Department of Highways, a predecessor of CDOT, was consistently being dealt black eyes for it's handling of rock falls onto its roads. Rock slide mitigation is an inexact science with very real consequences for failure. In 2012, rock slide mitigation is getting (significantly) better. Walter Borneman survived my curses to pen a 20th anniversary edition of the guide and appear in the film below. My dad came down off the mountain having tasted electricity and felt lightning in his fingers, surviving only to drag me up many more (with alarmingly variable results), and then safely retire last year, giving his last Jeep to my brother. You might even catch his own guide book out there. It probably doesn't mention his stuffing his son in a crevice under a rock ...but it should. After all, it taught his son to pray. Few today seriously understand how unwilling highway designers were to give up their precious right of way to a railroad that no longer existed! This film is just a small token of appreciation for James Grafton Rogers, a preservationist, a lawyer, and a veteran on this Veterans Day 2012.